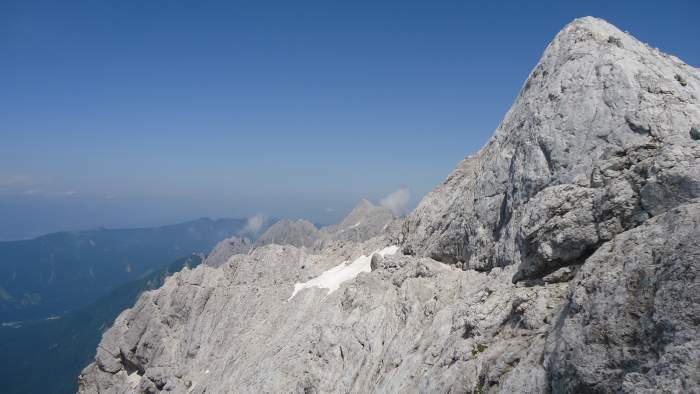 If you plan climbing Prisojnik (Prisank) in the Slovenian Alps, it is best to start from Vrsic Pass. You will need up to 4 hours to the summit. Read more below. 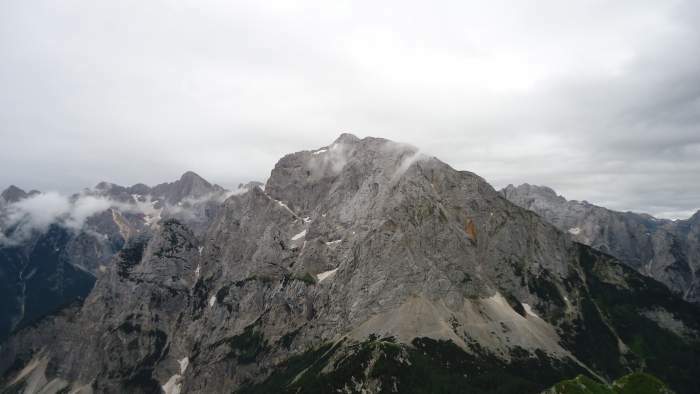 Prisojnik (Prisank, 2547 m, 8356 ft) is a colossal mountain when you watch it from the Kranjska Gora valley in the north, or from the Soca valley in the south. It is the Vrsic Pass only that makes the access to this mountain relatively easy. You have the car access to 1600 m above the sea level, but you still have almost one thousand meters to climb from the pass. 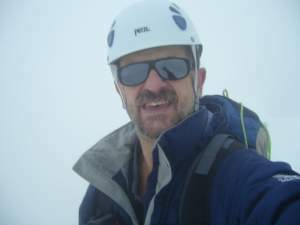 There are several routes to the summit, but I have climbed the Ridge route (Grebenska Pot) so my report is only about this access, I write only about routes which I have passed myself. Prisojnik as seen from my tour to Mala Mojstrovka on the opposite side of the Vrsic Pass. Elevation: 2547 m (8356 ft). 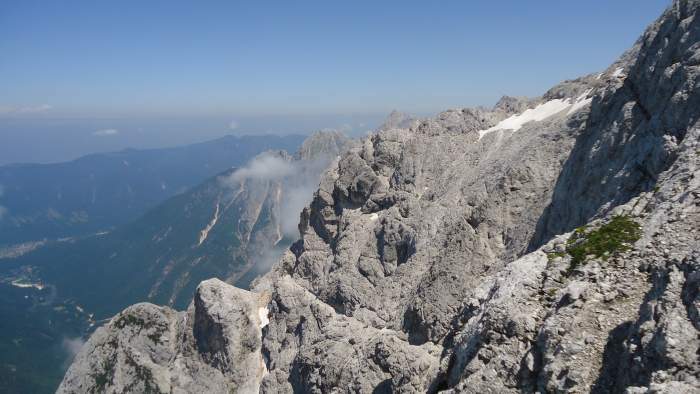 The Ridge route is with several ferrata sections and it is advisable to have the usual stuff for such an environment. So have a harness, a Y-rope, and a helmet. I have used them myself. 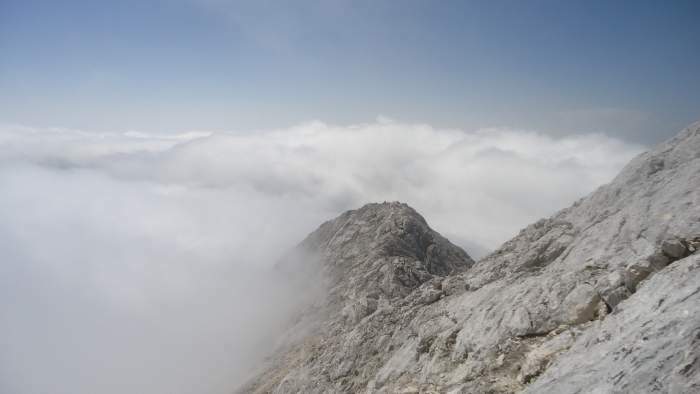 But I have seen a Slovenian woman whom I passed a few times and she passed me as well, climbing without anything, she only put helmet close to the summit. I asked why she was going that way and she replied she had climbed the mountain many times and knew it well so did not need the stuff. As for the clothing, I had all the usual stuff which I described in my earlier text what to wear for summer in the Alps; this implies the shell layer (waterproof pants and jacket) plus warm gloves, a cap, a fleece, etc. Somewhere in the middle of the tour. View towards the Vrsic Pass. The rough sketch of the Ridge route. I was there a year earlier and could not continue because of the snow. This time it was the first weak of July and the route was without the snow, just to know. 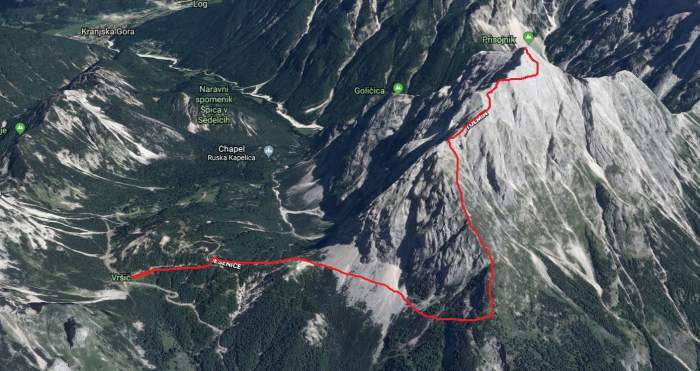 Coming earlier might be useless, you would not manage if there is snow on the route, cables might be covered, and also you would not find the route in general. At one point you will find yourself directly above Okno; if you are not familiar, this is a huge natural hole (window) in the rock. It is visible from the Road below. There are a couple of ferratas above this point and then a less steep section where you really follow the ridge in the east direction. Here you have to be careful, there are quite a few exposed passages and you just have to walk over them. The final section below the summit is much steeper and you approach the summit from the south side. The north side of Prisojnik, here goes its north route. An easy part on the ridge, above the clouds. I did it the hard way, after driving overnight all the way from Belgium without one minute of sleeping, parked at the Vrsic Pass around 10 AM and started soon after that. My initial plan was to take the Okno Route, but I realized there were many groups going that way and expecting that this would slow me down, I took the ridge. 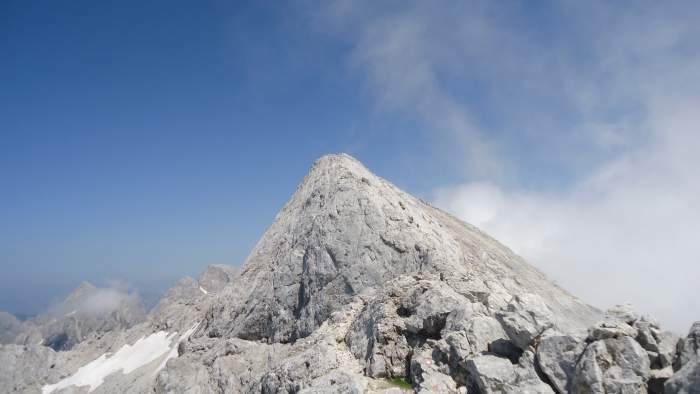 The summit of Prisojnik, the picture taken when descending. The Okno Route is a very steep ferrata and in the case of many people, you are probably forced to follow the same tempo. There may be sections to pass such groups, but I was not sure about this and did not want to risk, the time was precious as the weather was totally unstable. I asked some people about the weather forecast and I heard that there would be rain in the afternoon. So the Ridge Route looked like the best option. I started at 10:40 AM and I was on the summit at 14. There are some tables at the Ticarjev Dom (hut) close to the road which suggest that you need 4 hours but at some other places you will see 3 hours, so my timing was OK. I did not feel great after the sleepless night but I managed somehow. 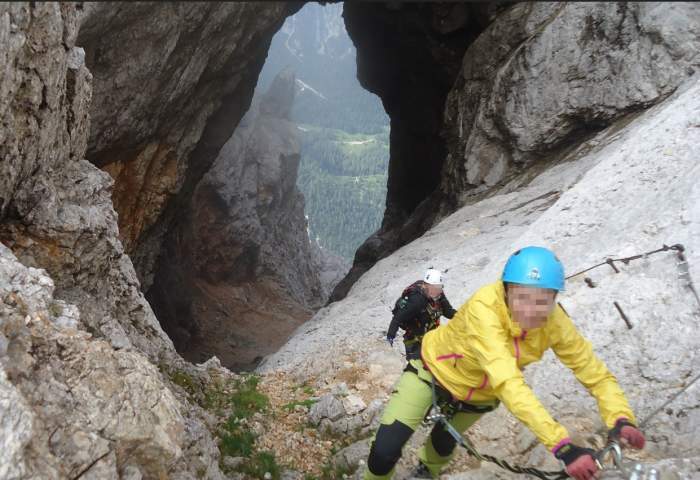 I had all the equipment but did not use the helmet in the lower part, so I had a chance a few times to check how hard the rock was when I kicked it with my head at some scrambling and ferrata sections. At some point, I passed the place where I had to give up on my previous attempt, and what I saw above that point only confirmed that this was a wise decision (yes I can act wisely occasionally). The mountain was still there this time, but most likely I would not be there if I had continued a year earlier. I passed Okno but this time it was filled with clouds and it looked threatening with the cold air streaming fast through it towards me. Above this point, there were a few sections with cables so I used my harness and other stuff. View to the north side from the ridge route. I was also carrying my coffee pot and the Pocket Rocket stove with a gas bottle and prepared my first coffee of the day at the summit, but being clumsy I managed to spill it all in the process just when it was ready, so imagine my despair when this happened. Did not have any drop left. – “Absolutely so.” I really meant it. It was totally worth the effort. Note that there is no cross on the summit, just a cairn and the box with some memory book and the stamp if you collect this stuff. A window through the clouds – view from the summit. On the way back, I met several groups of people going up. The weather was changing all the time so I wonder if they managed to the summit. Some of them were in jogging shoes. I continued and at Okno managed to capture just a few seconds when it was without clouds, so you can see it here below. When I was close to the hut it started raining a bit but it was not bad, very soon I was in the car and continued to Bovec in Soca valley. A rare moment with views and view through Okno towards Vrsic Pass far below. 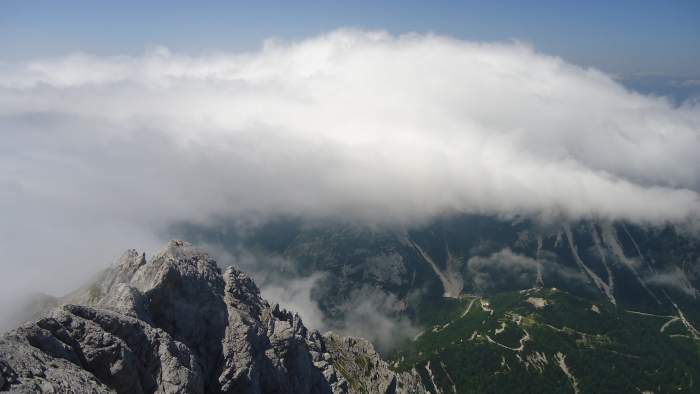 If you plan to climb Prisojnik, do not go unprepared, the weather can change very quickly. I am surprised to see how ill-equipped people go even when the weather is so changeable. 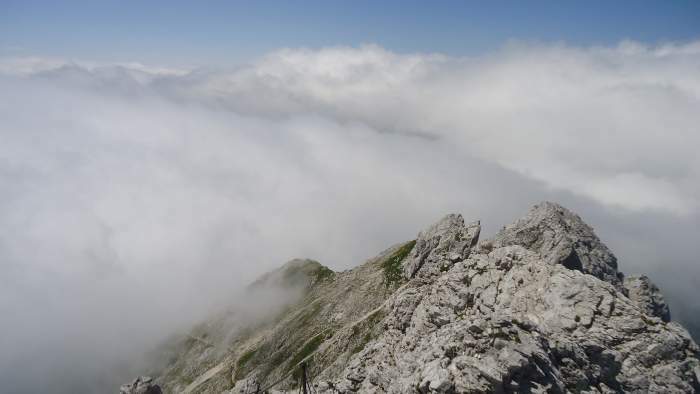 The Slovenian Alps are lower than the rest, but those are very sharp mountains and if you miss the route when clouds suddenly come, you might be in a great trouble. You cannot descend in just any direction unless you have a full alpinistic equipment and experience. I carried all my warm stuff and I used it many times along the route when the wind was strong and it became cold. Note, this was the first weak of July. This is a popular mountain because of the Vrsic Pass, but the height difference is still for every respect, you have 936 meters to climb. There is no water along the route so carry it in the pack. I did not use much, less than two liters, it was cold and I did not need it. You might need more if you climb on a warm day. Please see my text about Mangart which is close, I climbed it years ago, and Mala Mojstrovka text, this is a mountain just on the other side of the pass. 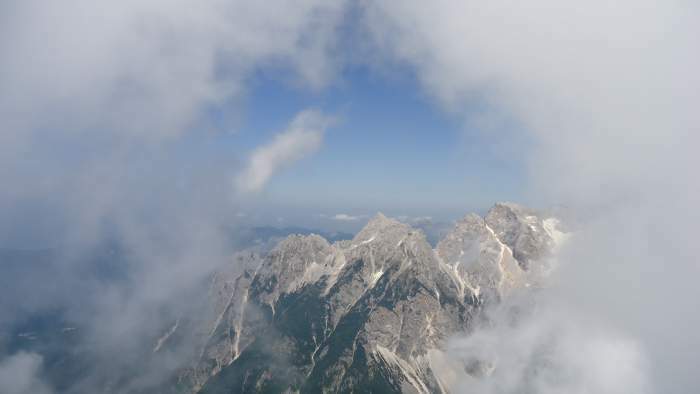 See also this report about the Zavetiste pod Spickom hut and my story about Triglav. Check also my story on climbing Jalovec and Krn mountain. 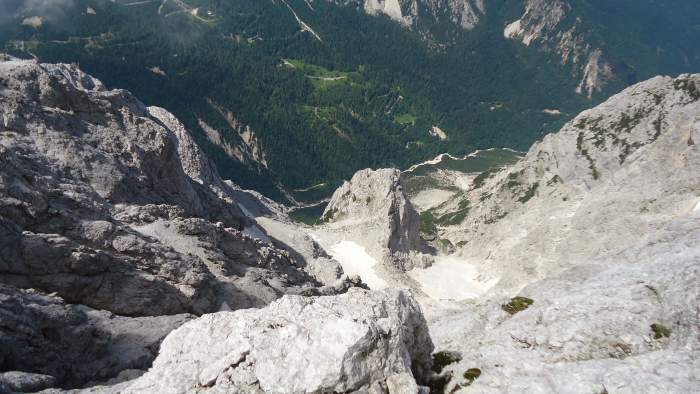 If you are in the area, you might also want to climb the nearby Jof di Montasio, it is on the Italian side. Have you been in the area? If so let us know, there is a comment box below, and I also have an invitation for guest authors.